Magnetic Chemical Labels save you the hassle of installation - they easily stick to steel or metal surfaces. Mention chemical contents with these bold, self-adhesive RTK labels. Give hazard ratings through NFPA Diamond or HMIS pre-printed on the labels. 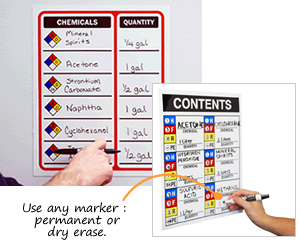 These write-on labels help your staff keep track of the chemicals and their quantities stored in cabinets or other storage units in your facility. • Standard size of labels is 15" x 12". • Labels stick to any steel cabinet and can be easily removed without sticky residue. • Include blank spaces for identifying up to six chemicals and their quantities. Magnetic – sticks to metal cabinets. Can be taken off when storage changes. For split doors, cut signs in half.